Siemens Speedfax™ Type BQD 100-Amp 2-Pole molded case circuit breaker is rated at 25-Amps and 480Y/277-Volt AC/125/250-Volt DC at 50/60-Hz frequency. 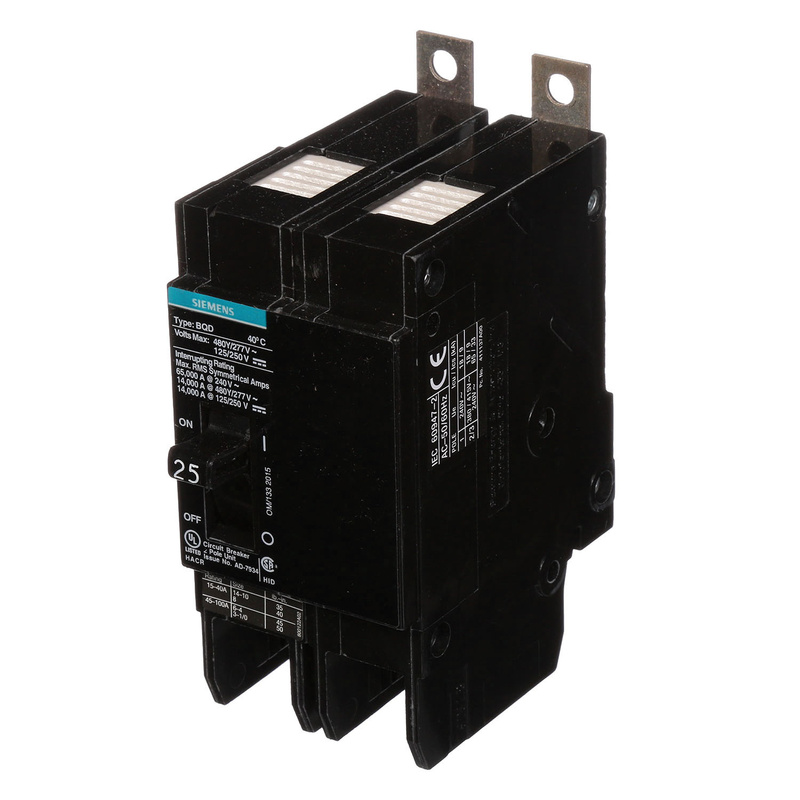 The interrupt current rating of this circuit breaker is 14-Kilo-Amps at 480/277-Volt AC/14-Kilo-Amps at 125/250-Volt DC. It has long-time and instantaneous fixed thermal-magnetic trip that opens the circuit to offer short circuit, ground fault and overcurrent protection for sensitive equipment. The 1-Phase bolt-on mountable circuit breaker with load side lug terminal connection, accommodates aluminum conductors of size 12 - 6-AWG and copper conductors of size 14 - 6-AWG. It has a dimension of 2-Inch x 2.7-Inch x 4-Inch. This circuit breaker withstands temperature rating of 40 deg C. It is suitable for use On P1/P2/P3/P4/P5 panelboard. Circuit breaker is UL listed and CE marked.